Aguado de gallina: Aguado de gallina is a thick soup made with chicken, rice, potatoes, onions, peppers, other vegetables, herbs and spices. 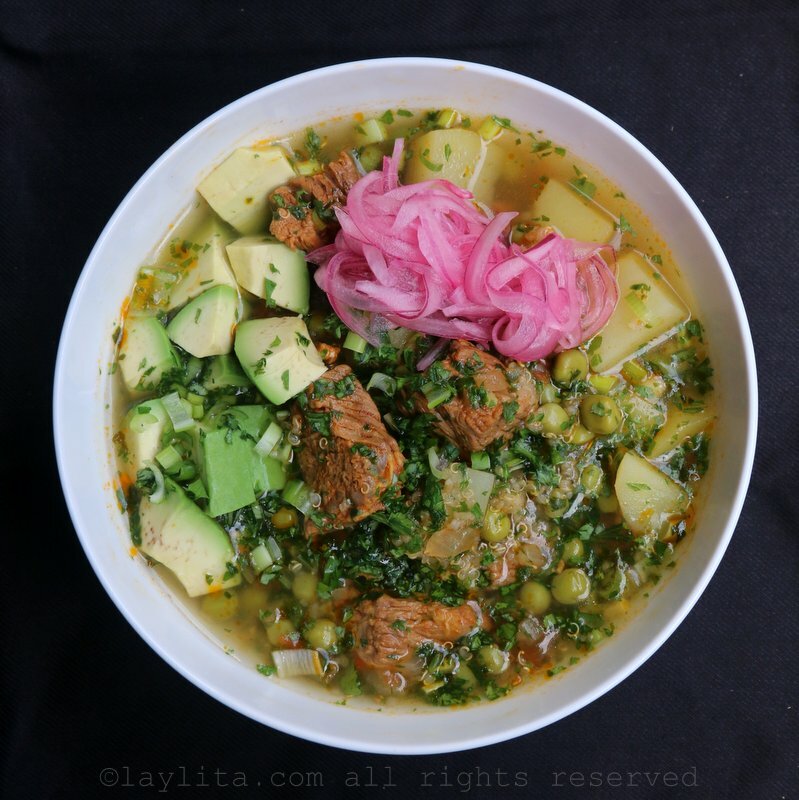 Arvejas con guineo: Arvejas con guineo is a typical Ecuadorian soup made with green bananas, peas, onion, garlic, cumin, achiote, cheese and cilantro. 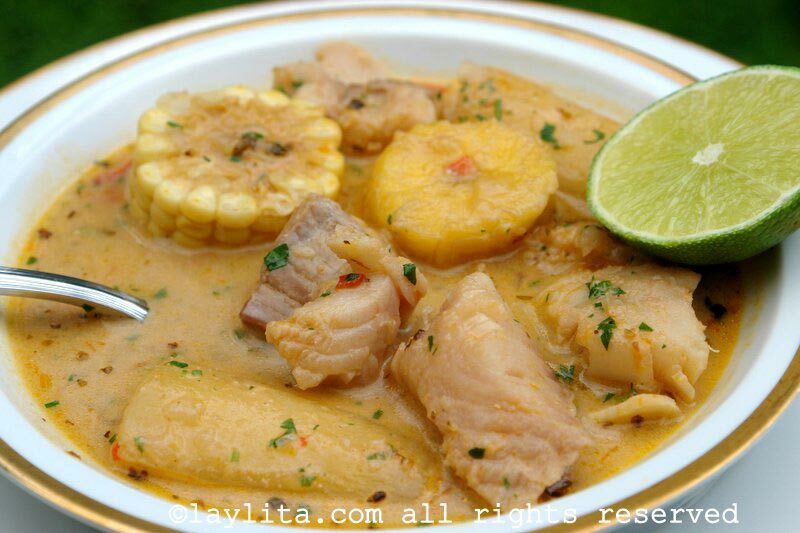 Biche de pescado: Biche de pescado, also called viche, is a typical Ecuadorian soup made with fish, peanuts, yuca, sweet plantains, corn, and other vegetables and spices. 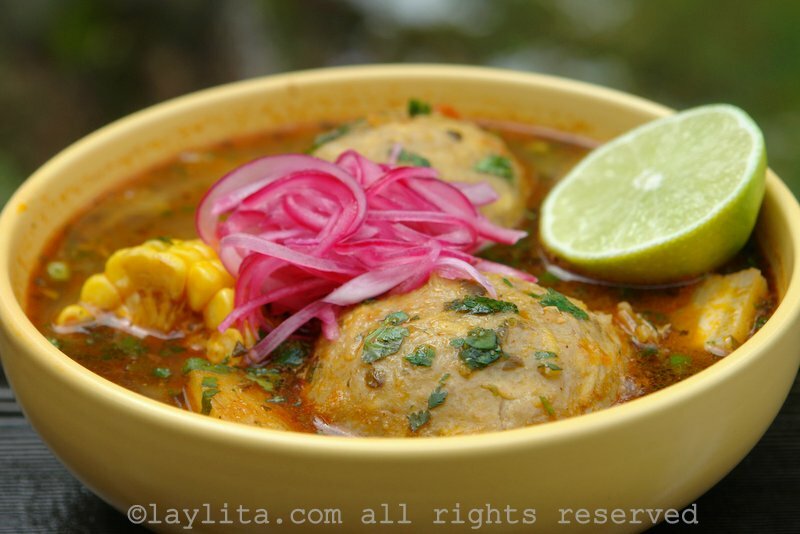 Caldo de bolas de verde: Caldo de bolas is a typical Ecuadorian soup of green plantain balls or dumplings stuffed with meat and served in a delicious broth with corn and yuca. 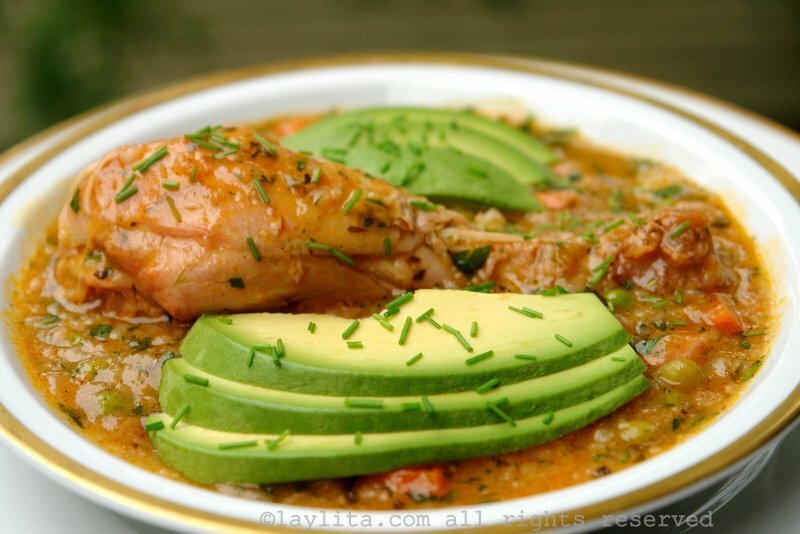 Caldo de pata or cow feet soup: Caldo de patas de res or cow feet soup is a traditional Latin American comfort soup made with cow feet, yuca, mote or hominy, cilantro, parsley, onions, garlic, achiote, cumin, peanuts, milk, oregano. 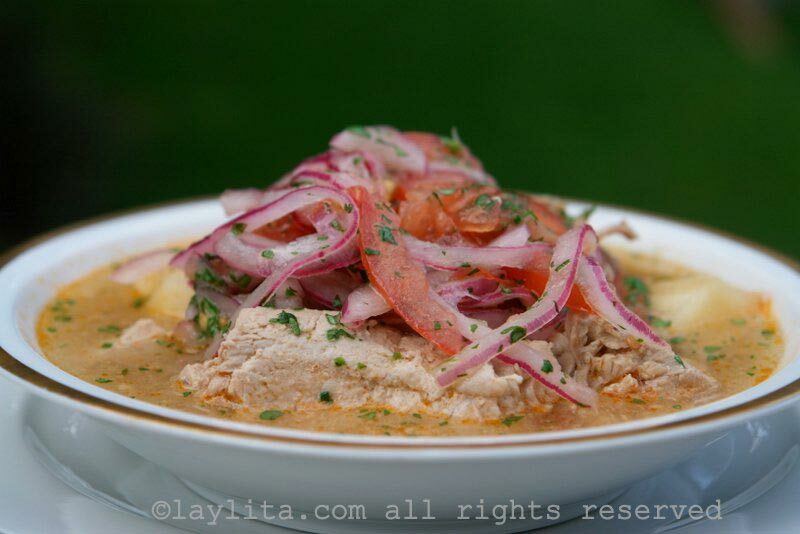 Encebollado de pescado: Ecuadorian fish soup recipe made with fresh tuna, yuca, tomato, onions, cilantro, cumin, hot pepper and topped with pickled onions and tomatoes. 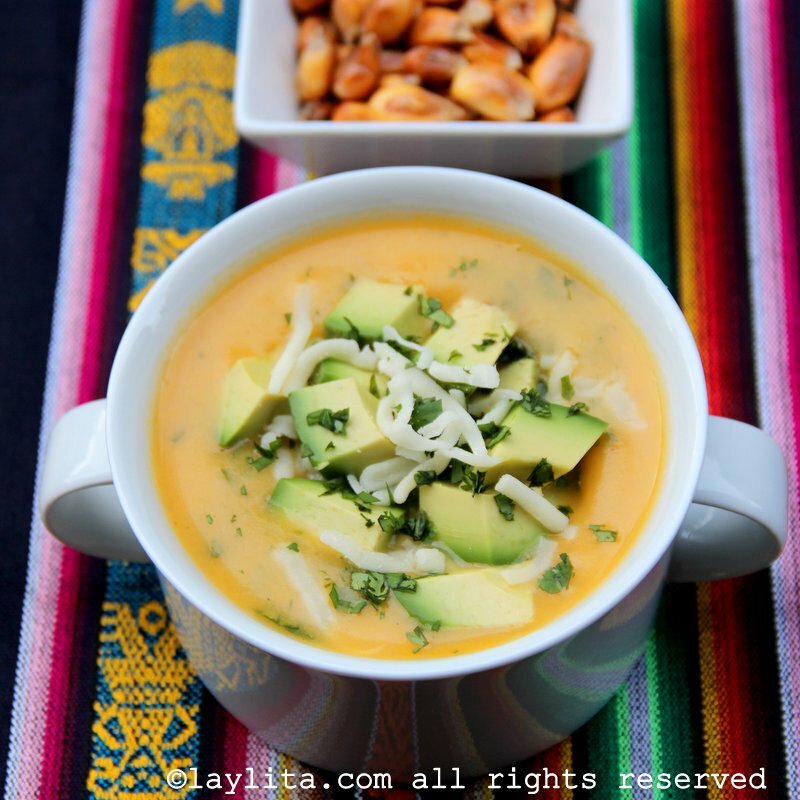 Fanesca: Fanesca is an Ecuadorian soup or stew made only during Easter, it is made with bacalao, squash, fava beans, chochos, corn, peas, porotos or fresh beans, rice, onions, garlic, cumin, achiote, peanuts, milk, cream and cheese. Locro de habas: Locro de habas is a thick soup made with fava beans, potatoes, milk, eggs, cheese, onions, garlic, tomatoes, cumin, hot pepper, and cilantro. 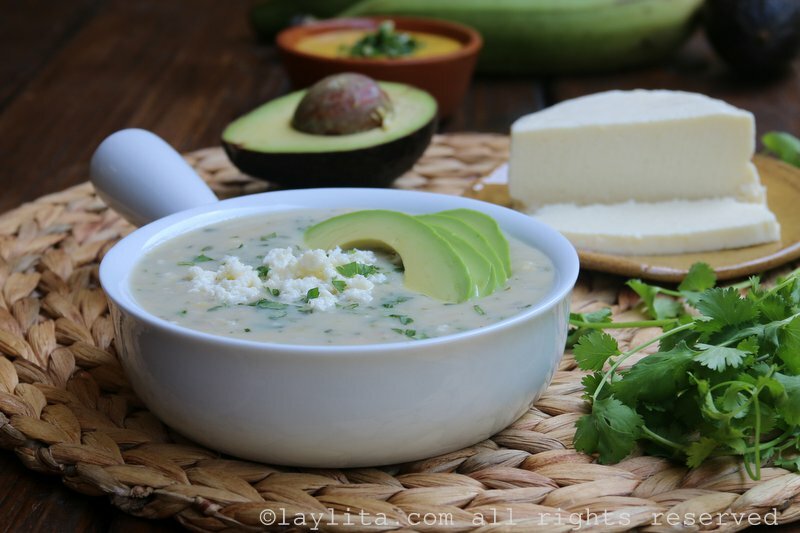 Repe lojano: Repe is a creamy soup made with green bananas or green plantains, onions, garlic, milk, cheese and cilantro. Sopa de quinua con carne: Healthy and delicious Ecuadorian quinoa soup made with quinoa, beef, potatoes and peas. Sopa de zapallo: Squash soup made with squash, onions, tomatoes, garlic, cumin, and chicken or vegetable stock, served with feta or goat cheese and chives. Dear Lay;ita, I am now living in Cuenca and trying out some local recipes. I am having a problem cooking with the meat, especially for stews. It is really tough. I tried to make sancocho using recipies found on YouTube. The meat it called for (hueso blanco I think) was so touht my dish was inedible. I’ve been cooking for most of my life althoughh I am not a trained chef. Any suggestions? Hi Harvey – I would recommend a pressure cooker for those tough cuts of meat, I remember almost always used a pressure cooker for meat (even for chicken if it as a gallina vieja or an old hen). For stews you can remove the meat once it’s tender and continue cooking the sauce part if you want a thicker richer sauce. Que lindos recuerdos. 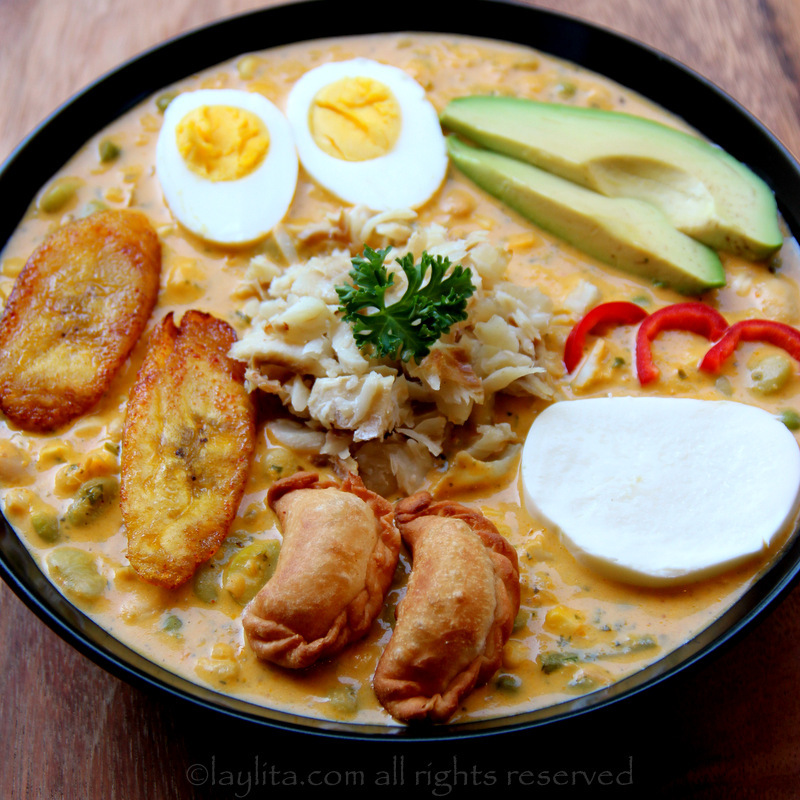 My mom used to make these soups for us when we lived in Guayaquil. 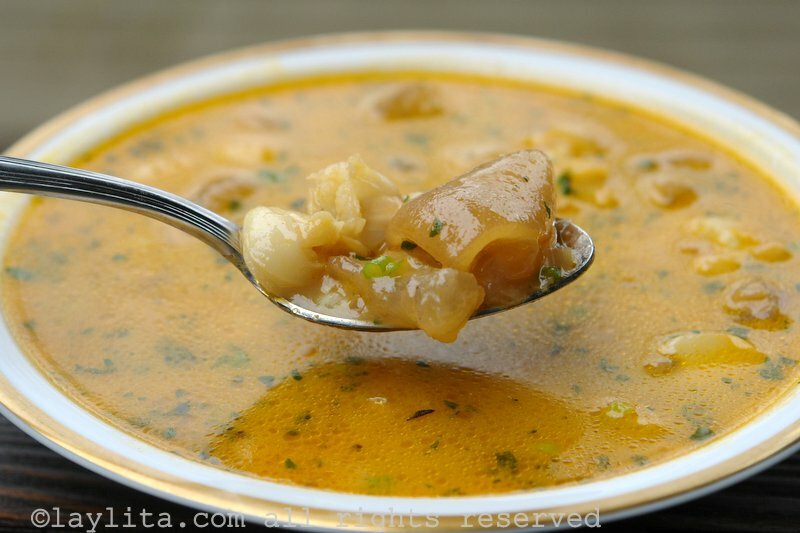 I live in Puerto Cayo, Ecuador and frequently eat the fish garlic soup. I am wondering if you have the recipe for this soup? I had a wonderful lentil soup in Cotacachi, Ecuador. Do you have a recipe for lentil soup? I am living in Cuenca, Ecuador and love this country! The soups are so wonderful here and I have been told that it is because they make their stock using chicken feet found in the mercados. The bouillon cubes here have good flavor, but contain MSG. And I have not seen canned nor boxed stock. Can you please post a recipe for these wonderful Ecuadorian stocks? My sister-in-law is from Ecuador and I would love to make her a traditional Ecuadorian meal. She lives here in the U.S. now and has not been home in many years, do you have any suggestions for any particular dishes that would make her feel at home? Hola Laylita. Te Felicito por tu web site . Soy Cubana casada con Ecuatoriano y cocino muchas comidas Ricas de Ecuador. Hace mucho tiempo que no hago el caldo de torrejas y me gustaria saber si no lo tienes ya en tu pagina (no la encuentro) si puedes publicar la receta. Muy rico todas las recetas tuyas, Gracias . :) Hope to hear from you soon . Thanks a lot . Hola Maritza – Voy a ponerlo en la lista de recetas para agregar a la pagina. Saludos! Hi Could you give me please a recipe for lentils soup without meat? Yes, it’s actually on my list of soups to post. Hi ! I am Korean but used to live in Ecuador when i was little and i’ve been missing their food a lot. i followed your receipe and Qinoa Soup came out really good !! Thanks and looking forward to see more of your good recipes. I’m looking for meat sancocho. If you have a recipe I’d love to have it! Hi Liz – It’s on my list of recipes to add to the site. I’M LOOKING FOR MEAT, LAYLITA, AND I’M PRETTY SURE IT WAS BEEF. HAD THE REST OF THE LOCRO LAST NIGHT AND IT WAS STILL DELICIOUS. MY HUSBAND, WHO LIVED IN ECUADOR FOR SEVERAL YEARS IN THE LATE 60S (PEACE CORPS VOLUNTEER) SAID IT TASTED JUST LIKE THE LOCRO HE REMEMBERED. I made your locro de papas and it was great! Do you happen to have a recipe for sancocho (I think I got the spelling right)? 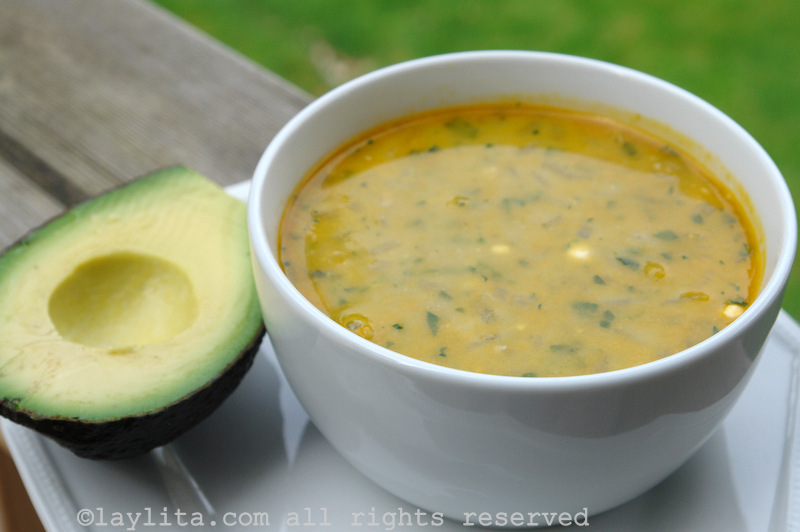 I lived in Quito in the early 80s and I loved this soup, which was a clear broth with amazingly interesting flavors. 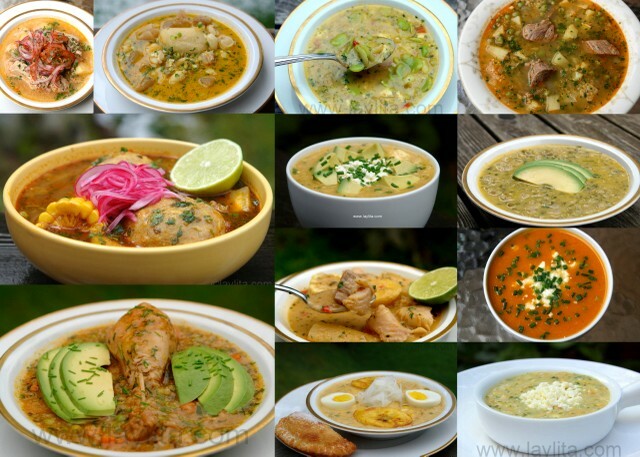 Hi Liz – Are you looking for a fish sancocho or meat (pork/beef) sancocho? When visiting in Ecuador I had a fabulous soup. When I asked about it they simply called it a lemon soup. It was a creamy lemon with quinoa. More on the watery side than heavy, with a lemony tang. I have looked high and low for a recipe and tried to replicate it with no success. Does this sound like anything you remember? I would love to make it here at home.